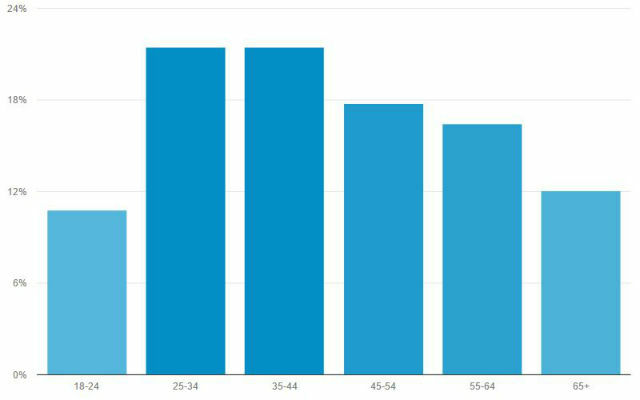 Chart from Google Analytics shows the age distribution of Times of San Diego’s readers in June. Times of San Diego was read by 208,958 people in June, a 24 percent increase from readership in the same month a year ago. Traffic in June was boosted by the website’s popular voter guides to the primary election and coverage of the local and state races on election night. The independent local news website is now in its third year of publication with a steadily increasing following, especially among Millennials and Gen Xers. People aged 18 to 44 accounted for 57 percent of readership in June. The youthfulness of Times of San Diego’s readers is in sharp contrast to the audiences of printed newspapers and television news, which are primarily aged 60 and older. More and more readers are viewing Times of San Diego on their smartphones. In June, 47 percent of reading sessions were on smartphones, 9 percent on tablets and the remainder — 44 percent — on desktop and laptop computers. The site uses responsive design to automatically resize for different devices. Websites can reach an international audience, but most of Times of San Diego’s readers are local. In June, 49 percent of reading sessions were in San Diego County, and another 10 percent elsewhere in Southern California. Times of San Diego is produced by a staff of seven editors and photographers based out of The Vine startup workspace in downtown San Deigo. The website is free to the public and supported by advertising and reader donations. For more information about advertising, please contact advertising@timesofsandiego.com.